Both tree trimming and tree removal services are complex, but the tree trimming service is surprising because you’d think that such procedure takes a short time to do. You can’t just trim trees by yourself, especially if you don’t have the proper equipment and harnesses to keep you safe. Hire a professional. Hire Knoxville Tree Service to do the work for you. When we service your trees, our style of tree trimming can drastically improve the beauty and health of your tree and the surrounding landscape. This is one of the reasons why we are the tree service Knoxville needs. We stick to the tree trimming guidelines set by the Arbor Day Foundation. The manner with which we service trees is individualized, not collective. This means we treat each tree with a specific trimming strategy and technique that’s applicable for that particular tree. Moreover, our tree services team doesn’t treat your tree in an unnatural manner. It’s vital to keep each species’ natural aesthetic, and not to trim them like poodles. As you call us, one of our arborists will visit your business location or home and assess the tree that you want trimmed. After fully assessing your tree or trees, the arborist then gives you a service estimate and a recommended approach. If we agree on the terms, we’ll set a time and date for our service team to come back and trim the tree. Knoxville Tree Service encourages your input, especially when it comes to the end results and the trimming style. However, if it seems your tree risks being damaged or over-trimmed, we suggest other alternatives. When we come back on the service day, our professional team with the appropriate equipment will arrive at your place. Our team arrives within two hours of initially informing you. Our specially designed tree-trimming heavy equipment does the job well. If you wish, we can also trim trees on your property with only climbing gear. 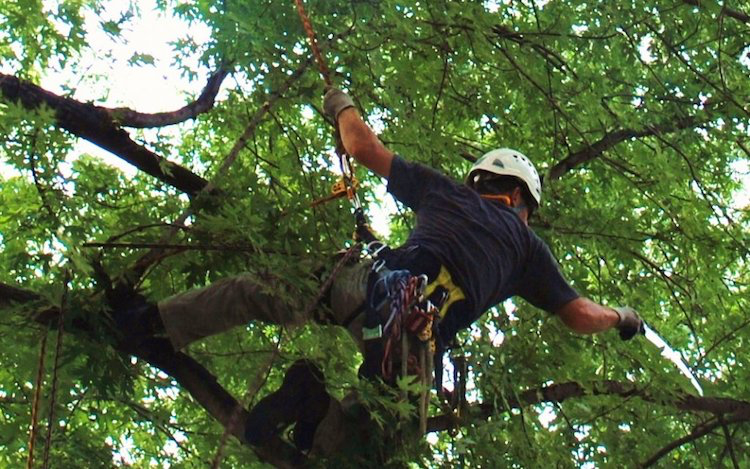 Safety is not compromised as our tree service personnel wear the right harnesses. This option is also light on the budget for you. If you want that option, inform us in advance. Our team will work by making the necessary, skillful cuts, starting at the higher branches and working down to the tree base. At all times, we have a ground crew to make sure the area is kept safe and clear. After the tree trimming process is done, the large branches will be hauled away or stacked on your property, depending on your instructions. The smaller branches will be placed inside the wood chipper. Each cut affects the growth of any future branches. Thus, make sure to hire a professional to work on your trees. We are the company for tree service Knoxville trusts, and we assure you that our team is able to efficiently trim your property’s trees. When you go for our tree service, we can assure that your tree branches grow out beautifully. We know that the technique used and the time of year can affect the health and trimming of your tree. We aim to give communities peace of mind and excellent service. If your trees look shabby, overgrown, or the branches become a public nuisance, allow us to help you restore your tree and landscape’s beauty.